Emily and her Mum, both feisty, loud and volatile, have had a big row on the night that Mum receives a mysterious letter and disappears into the darkness to solve a family crisis. When Emily’s quiet, seemingly boring, Dad goes to find her and fails to return, Emily decides to set off in search of her vanished parents. Following her Mum’s advice to “never knowingly be under-snacked”, Emily packs sandwiches and a hedgehog companion and heads off into the world of the Midnight Hour. 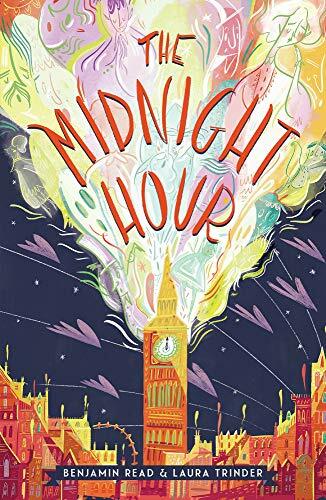 This turns out to be a sort of Victorian London frozen in time by the chimes of Big Ben, run by magic and peopled by the Night Folk, an assortment of monsters and creatures from myths and nightmares. Here, Emily befriends and commandeers Tarkus of the Night Watch, meets “The Library”, a powerful magical character, and discovers that her Mum is a secret agent librarian, her Dad works for the heroic Night Post in charge of dangerous deliveries and that she herself is a shape-changing pooka. All must unite to defeat the deadly Nocturne who plans to use the power of magic and music to destroy the Midnight Hour and invade the day time world. This is a brilliantly inventive and quirky fantasy adventure story with an outspoken, determined, brave and funny heroine who is full of attitude and self-confidence. Humour and magic combine throughout, with plenty of scares too, the pace never lets up and the dialogue is sparkling and witty. All in all, this is an excellent addition to the magical fantasy genre and, with sequels and a film planned, Emily and her surprising family, plus assorted companions, should be keeping readers entertained for some time to come. Read our Q&A interview with Laura Trinder.